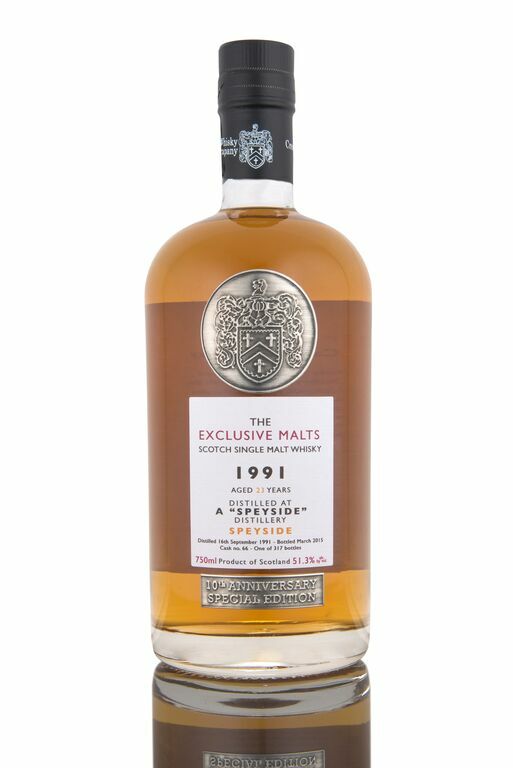 The Exclusive Malts Speyside 1991 23 Year Old – Review. The Nose: A somewhat expected, though altogether pleasant and lightly complex nose. Pale, floral honey, vanilla bean ice cream, ripe tropical fruits, and bit of orange sherbet. Further back, there’s a some malt syrup and a subtle nutty hint of that Italian pistachio nougat, torrone. The sweeter side is balanced by smooth, polished oak and wet limestone. Full, yet soft spice notes of cinnamon, and a little clove and nutmeg. A little water works nicely to smooth things out a bit and add more malt and grain notes. The Palate: More honey, vanilla bean, and juicy tropical fruits initially, but the palate quickly delves more deeply into the wood and spice of this one. Notes of toasted grain and nutty chocolate fudge lead to a rolling swell of tannic oak. Strong touches of black peppercorns, a bit of coriander, and allspice lead to the finish. As with the nose, water calms the wood and spice a bit, integrating it all, and adding more malty sweetness. The Finish: Lengthy. That honey carries through, but it’s almost drowned out by the continuing strong notes of oak, spice, and what I’d swear is a bit of barrel char. Thoughts: Very nice. While the flavor profile is somewhat conventional, there is enough subtle…and not so subtle complexity here to keep things interesting. This one does get a little heavy on the wood and spice towards the end, but it manages to not go overboard. While it doesn’t necessarily need water, adding a little toned down the strong wood and spice notes and helped balance the progression a bit more. This is a quite good whisky, though as with the recent 20 Year Old Highland, value-wise, it does seem a little pricey at around $175.